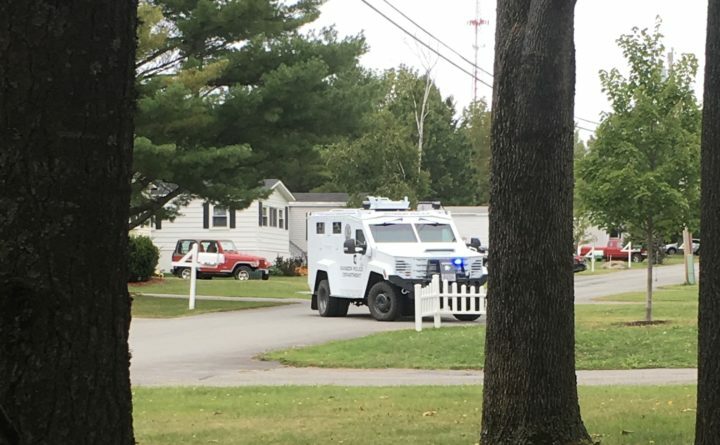 Police police used an armored truck to coax a man from a Bangor mobile home during a standoff on Wednesday. Bangor police arrested a 25-year-old man who caused a two-hour standoff at a mobile home Wednesday afternoon, which shut down portions of that neighborhood. Police responded to the C Street residence inside the Birch Hill Estates mobile park at 1:15 pm, after someone reported a man was waving a rifle in the street during a heated argument with an older woman, Bangor police Sgt. Wade Betters said. An ensuing police standoff shut down A and C streets for several hours Wednesday afternoon, he said. By the time police arrived, the man — later identified as Benjamin McGary — went inside the mobile home, the sergeant said. Police circled the house, forming a perimeter that included the department’s armored truck, a bulletproof vehicle. After police negotiators failed to make contact with McGary over the phone, officers drove the armored truck into the mobile home’s driveway to gain better visibility into the house, Betters said. That prompted McGary to poke his head out the window, unarmed, according to the sergeant. The truck backed off, and over a loudspeaker, police convinced McGary to exit the house about five or 10 minutes later, according to Betters. Police obliged the 25-year-old’s request for a cigarette, then placed him under arrest and drove him to be medically evaluated at a local hospital, Betters said. No one was injured in the standoff and no shots were fired. After his release from the hospital, McGary was booked at the Penobscot County Jail for violating a protection order that prohibited him from possessing a gun — police found a rifle inside the mobile home after the standoff ended, Betters said — and on an outstanding arrest warrant from an unrelated state police case related to alleged domestic violence.